A printer is a device that can take information that the user inputs, including text and pictures or any other type of electronic media, and outputs them onto either a physical sheet of paper of any size or can be printed into a physical 3D object. 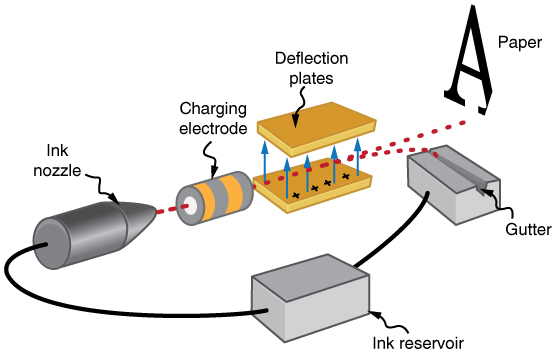 Inkjet printers was first extensively seveloped in the early 1950's. It involves the process of propeling dropletes of ink onto sheet materials such as paper or plastic. In the late 1970's printers that printed a digital image generated by a computer were developed. One of the first commericial devices using inkjet printing were medical strip chart recorders.2 On the right is a diagram of the inside workings of an Inkjet printer.